Mr. Sparkman has credited me as the donor of the photostatic copy of the “Grafton Papers” that is now held by the PCA Archives. I would hesitate to be considered the donor. I would consider myself rather to be the channel or the pipeline for the actual donor. After serving as a member of the Candidates and Examinations Committee of Grace Presbytery, the PCA’s presbytery in south Mississippi, I was elected as Stated Clerk of that Presbytery. 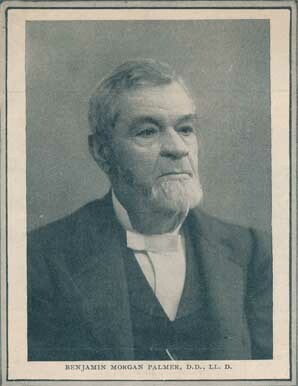 The eldest minister member of Grace Presbytery at the time was the retired Reverend Mr. James (Jimmy) Grafton Spencer, former pastor of the First Presbyterian Church on Crystal Springs, Mississippi. Not too many years into my term as Stated Clerk, Mr. Spencer approached me during a Presbytery meeting to ask my advice about some historical papers he owned. Realizing that his time on earth was drawing near to an end, he was concerned that these papers not be lost. He asked me to take possession of the papers and that I find some depository where they might be preserved. Mr. Spencer gave me a brief description of what the papers were: that they were a photostatic copy of a transcript of a history of early Presbyterianism in Mississippi and Louisiana. The paper had been written by the Reverend Mr. C. W. Grafton, a long-time minister of the Union Church PCUS in Union Church, Mississippi. The papers had been given to Mr. Spencer because he was a near relative of Mr. Grafton. I accepted the papers and the challenge. After perusing the papers, I realized that the PCA Archives might be an appropriate place for the papers to be preserved. The papers had been copied via a 3M process. The process was adequate to make copies but the quality of the copies deteriorated rapidly especially if exposed to heat or light. I was pleased therefore to discharge my commitment to Mr. Spencer when Mr. Sparkman accepted the papers for the archives.